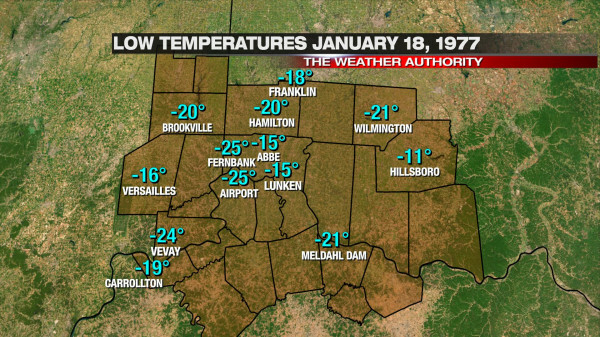 In Cincinnati, the month by which all cold or snowy months are measured against is January 1977. Those who have lived in Cincinnati for decades – regardless of when they were born in the 20th century – will tell you the winters of 1977 and 1978 were the coldest and snowiest. The average high temperature that month was 22°; the average low temperature was 2°. 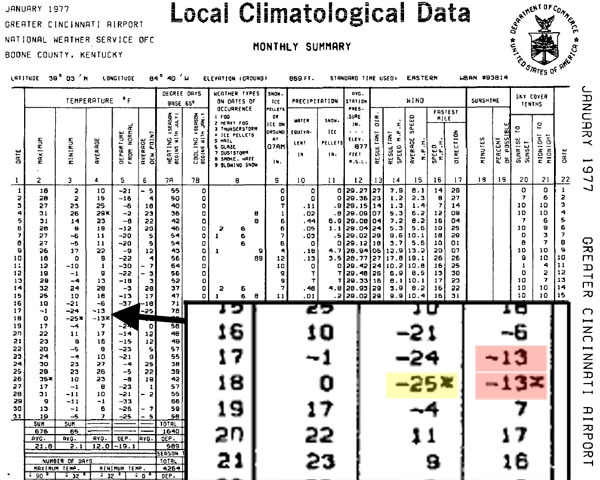 In January 1977, the low temperature dropped below 0° 16 days, and the high temperature didn’t even get to 0° one of those days. Over 30″ of snow fell that month, and 13 days of that month began with 10″+ of snow on the ground. It was cold. In the mid 80s and 90s, sharp cold shots and a deep snowpack over the Ohio Valley allowed the temperature to dip to -20° or colder, but those cold blasts were not as prolonged as the cold of January 1977. 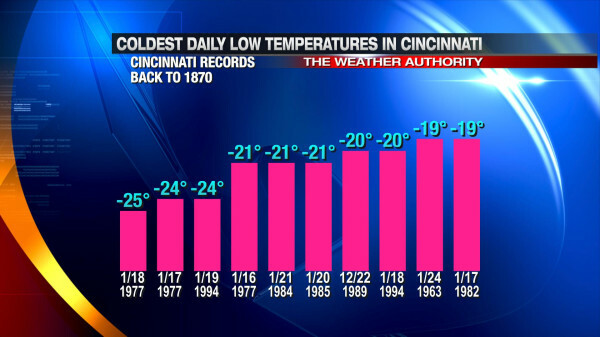 Two of the coldest daily low temperatures on record in Cincinnati were set on consecutive nights. The all-time coldest low temperature for Cincinnati was set on January 17, 1977 (-24°); the following night – January 18, 1977 – the temperature dropped to -25° at the Cincinnati/Northern Kentucky International Airport, which was the new all-time coldest low temperature recorded. 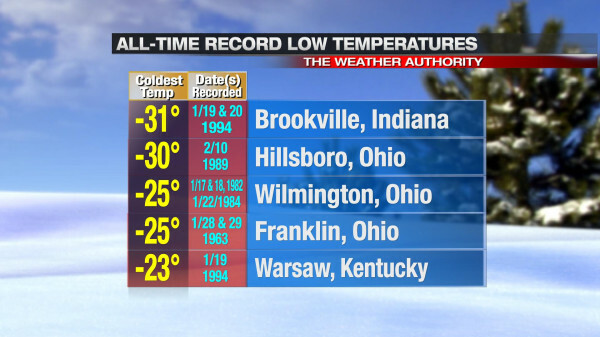 Prior to these days, the all-time record low for Cincinnati was -19°, set on January 24, 1963. Using the average temperature as a measure, January 16th, 17th, and 18th of 1977 is the coldest 3-day stretch on record in Cincinnati. 5-10″ of snow covered the Tri-State on January 19, 1994. Maysville’s all-time record low temperature was set that morning, but January 17th and 18th, 1977 weather records from Maysville are missing…when it may have gotten colder than in 1994. While the numbers tell a story, the photos from January 1977 tell more. 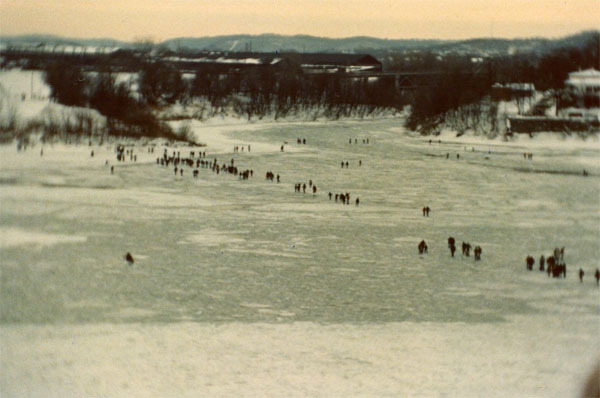 Many did what may never be possible again in our lifetimes; they walked across the frozen Ohio River. National Weather Service records show navigation up and down the Ohio River past Cincinnati was suspended from January 25 to February 2, 1977. The photo above shows travel across the river by foot was easier than down the river by boat. The several party boats were stuck along the shore for days. The Showboat Majestic was surrounded by ice. Not everyone remembers tornadoes, floods, or hail storms; those weather events often affect a select group of people and don’t always leave a large footprint. 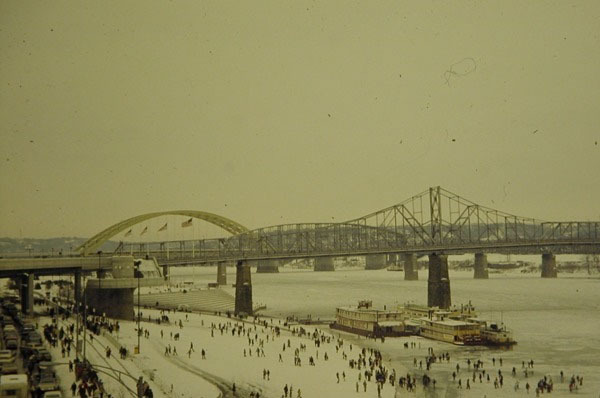 Perhaps more than any other Tri-State weather-related event, those who lived through the snowiest, coldest January on record or walked over the Ohio River remember it. Pingback: Springtime Work | Intrinzic Inc. It seems like you are always reporting the coldest temps of the year on or about January 17. Hopefully we won’t see any days colder than Monday, January 18. Keep giving us the history of the weather in our area. I enjoy it. I lived in Hamilton, Ohio that January of 77, having arrived on the first of month. Had previously lived entire life in south Alabama, where coldest temp I had experienced was probably a very rare mid teens and even rarer snow of a few inches. Unbelievable introduction to Ohio! I remember I was a senior in high school that year and with the wind chill it was 50 to 60 below zero and we had a lot of snow too.